TSP and Non TSP areas Teachers and Specialist Teachers. TSP (Scheduled) Areas recruitment is only for the districts of Rajasthan State for Elementary Level 1-5 and Secondary Level 6-8 class teachers and special teachers. 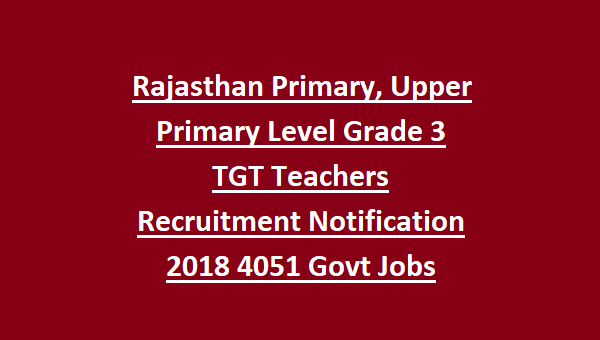 There are total 4051 vacancies available in this TSP Area recruitment and 23949 Grade 3 teachers jobs in Non TSP Area of Rajasthan Teachers of Primary Level and Upper Primary Level Schools. 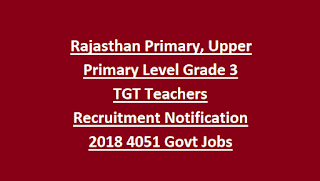 For TSP Level 1-5 class there is 3979 teachers jobs and for 6-8 Level Teachers 72 vacancies available in TGT Teachers Recruitment of Rajasthan Elementary Education. In addition to the TSP Vacancies recruitment of Elementary Education department of Rajasthan has also released a notification to recruit the Non TSP areas Schools of Primary for 1-5 classes and Secondary level for 6 to 8 Class Teachers and special teachers. There are total 23949 teachers vacancies available in Rajasthan Schools of Primary and Upper Elementary Schools. For Elementary level Teachers of 1 to 5 classes 23271 vacancies and Secondary Level Teachers of 678 vacancies available in Rajasthan Schools. For both the Non TSP and TSP areas Teachers recruitment last date for submitting application is 23-August-2018. Eligible and interested candidates can submit their applications online using official website of education.rajasthan.gov.in/tgtrecruitment. Final list for this recruitment will be prepared based on marks secured in RTET or REET. This recruitment is for Non TSP are and TSP Area candidates. For Non TSP Area Candidates 23949 posts and TSP area candidates 4591 Grade 3 teachers posts available. .
For TSP Areas Teachers Jobs Vacancy details please see the below given information. For Non TSP Areas Teachers Jobs Vacancy details please see the below given information. Age limits are 18-40 years for TSP Area 3rd grade teachers jobs. Pay Scale for Rajasthan 3rd Grade Teachers jobs is Rs.23700/- as per level 10. The candidate must have qualified RTET or REET with at least 60% of marks. Candidate belongs to Scheduled Areas of respective districts for them 36% of marks is required to apply for this Rajasthan TSP Area Teacher Jobs Recruitment. Selection for this Elementary and secondary level teachers recruitment will be held based on marks secured in REET/RTET 2015, REET 2016, REET 2017, REET 2011 and REET 2012. A Merit list will be prepared based on percentage secured in REET. For all the candidates a minimum mark to be considered is 60% and for Scheduled Area candidates minimum percentage is 36%. Preference will be given to their respective districts only. For more information related these selection processes please see the official notification. There is no written test for this recruitment of Rajasthan Elementary and Upper Elementary Schools Teachers Jobs. Based on merit list only candidates will be called for personal interview or certificates verification and posting will be allotted. Candidates can submit their application form online using the official website of education.rajasthan.gov.in and before applying must ensure the educational qualifications, age limits and available vacancies in your respective district and then proceed to apply online. At the time of applying online upload signature, image and mobile, email Id. Last date to apply online is 23-08-2018. For Non TSP Areas Teachers Govt Jobs Vacancy details please see the below given information.